We wanted Pat to have sleek and stylish planters in her garden. Elho have a fantastic range of them and we used the b.for soft air round hanging planters for her pergola. 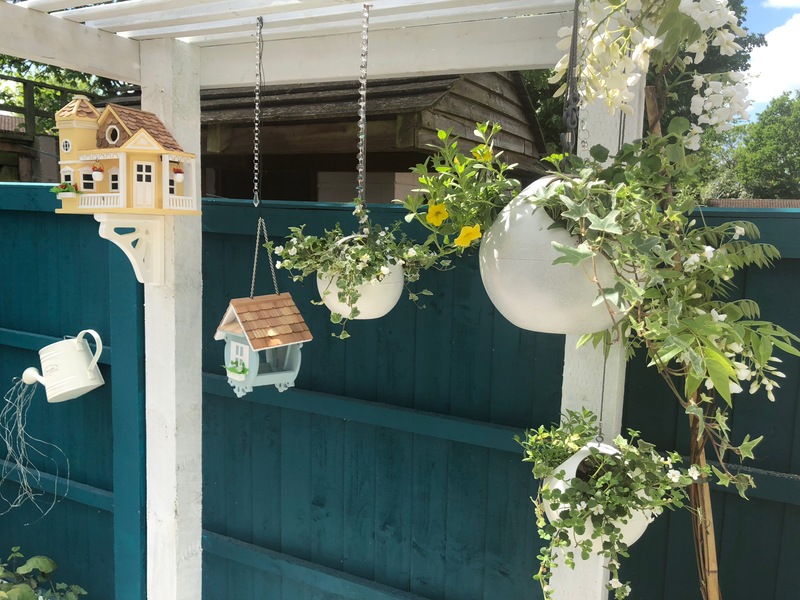 These are fantastic for planting trailing plants in and they have an adjustable cord so you can hang them at different heights. Display your flowers and plants to the best advantage with this stylish hanging flowerpot featuring soft, round forms. 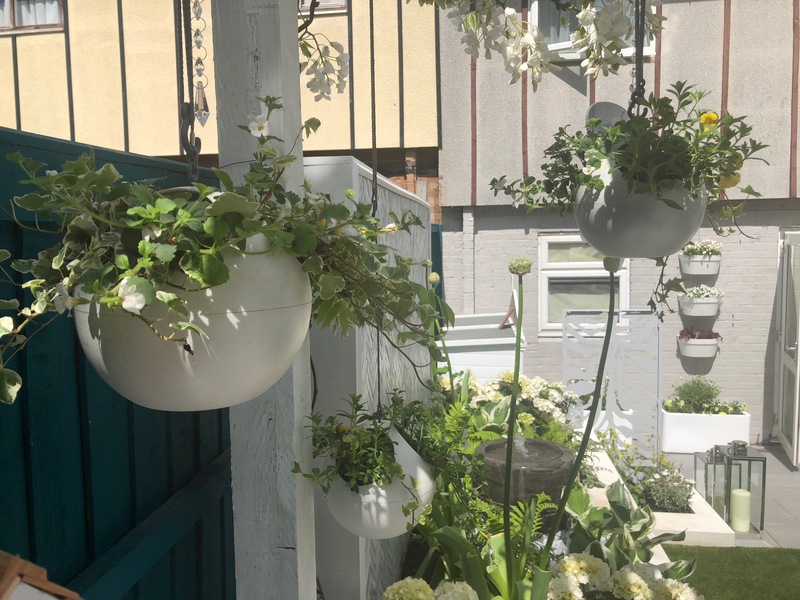 Choose your colour and combine several hanging planters at different heights to give your interior a contemporary/natural touch. Pat’s walls were built using hollow, dense Readyblocks which were only 140mm wide. These were built using mortar and filled with concrete. Their narrow size at 140mm instead of the standard 215mm makes them the perfect block to use where space is at a premium. The walls were then rendered by Rendit, who used a white coloured render from K-Rend. For over 28 years K Rend has offered a high quality extensive range of external silicone renders and finishes, designed to give a durable weatherproof coating and a natural finish. The benefits of using a coloured render is that you don’t have to paint it and it offers huge protection to your walls – whether garden walls or on a building. The render is sprayed on before being hand trowel finished.We think the end result is stunning – crisp, clean LA style garden raised planters. 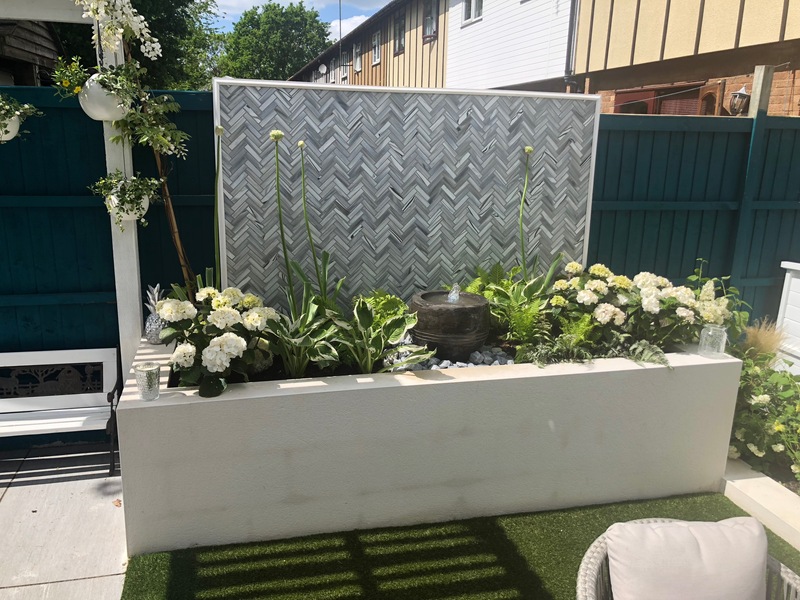 Pat has a fabulous zebra print feature wall in her house and we wanted to reflect this in her garden. 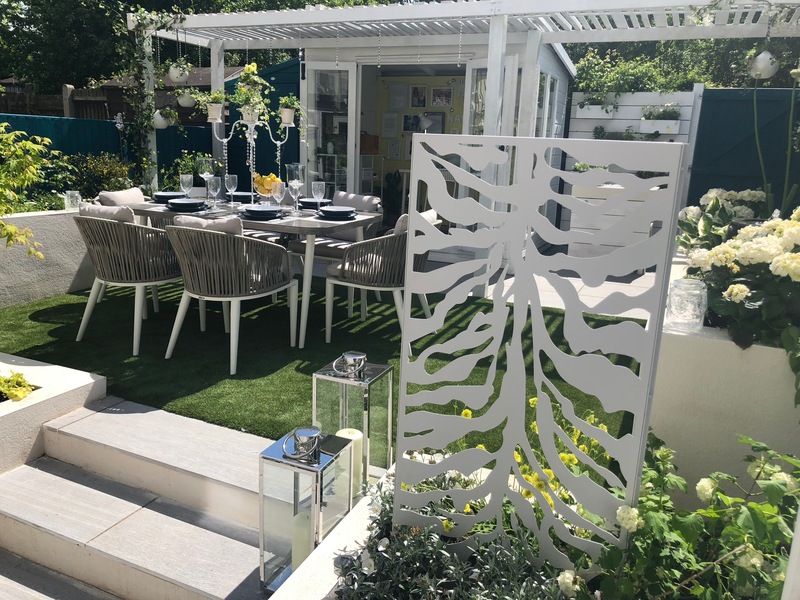 The Ideal Garden Shop manufacture a range of decorative metal screens and the Zebra Screen is perfect for Pat’s garden. 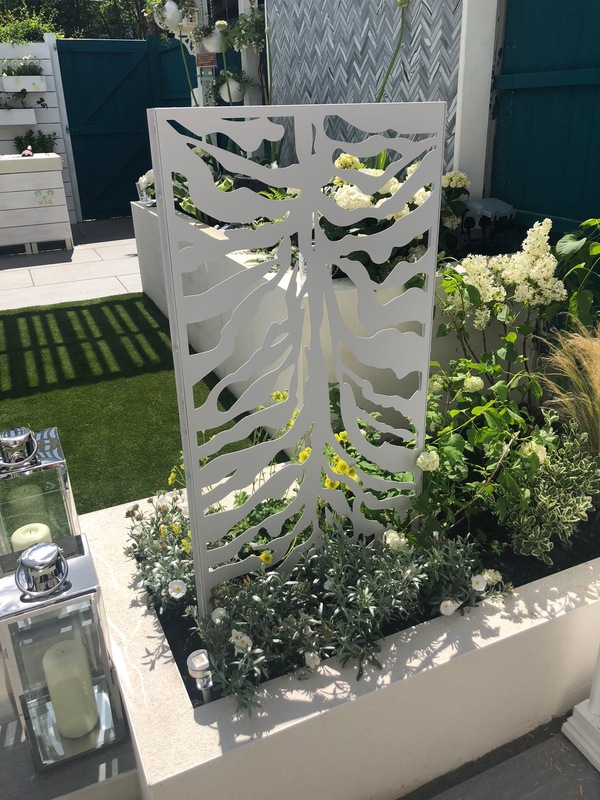 These robust 1200mm x 600mm x 20mm thick Modular metal panels connect to create the most amazing Garden Screens. 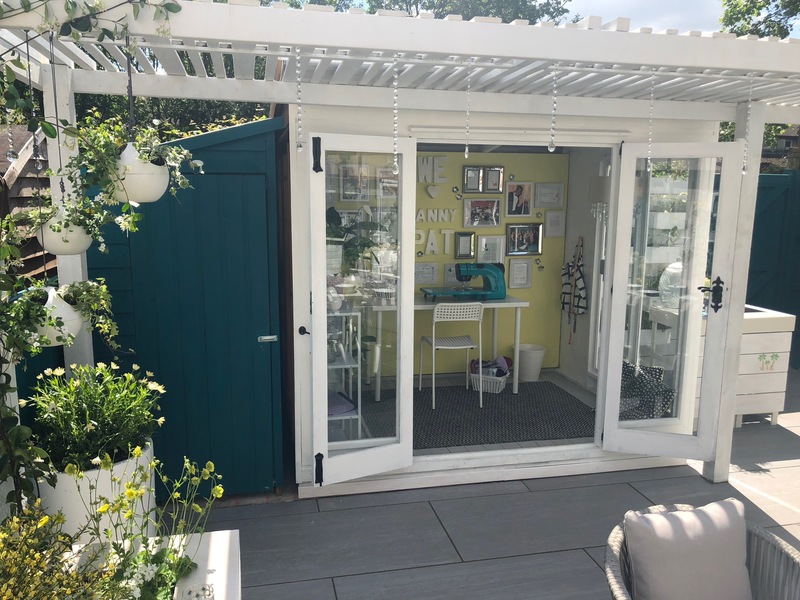 The screens are strong, easy to connect and maintain – manufactured from 1.6mm Galvanised or Cor-Ten weathering steel and available in a range of UV stable RAL colours, these screens are made to withstand the test of time and the harsh UK climate. The maintenance free screens are polyester powder coated, applied in liquid form and heated to form a hard wearing, scratch and UV resistant barrier against the elements. Pat wanted a garden building to relax in – a garden building also extends the amount of time in the year you use the garden for. This building is in a contemporary style, built from treated timber. It offers Pat plenty of space without dominating the garden like her previous one did. 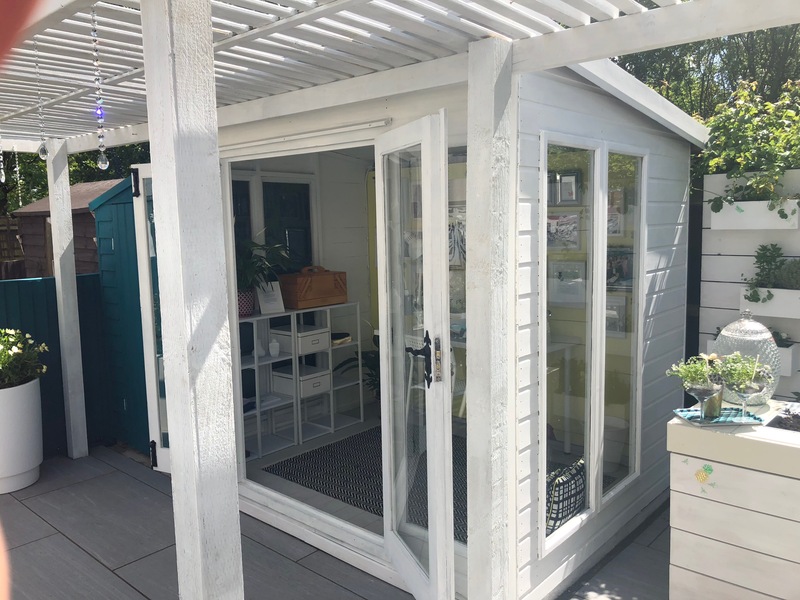 Poultons do a fantastic range of bespoke offices and buildings suitable for any type of use or style of garden.